Fontana Suites and Fontana Gardens (right) ... being built using Paschal systems. The Gravity Indoor Skydiving centre at Wasmiya is among the unusual construction projects that have recently been shaped using formwork solutions from Paschal Concrete Forms, one of the leading suppliers of modern systems to the GCC’s construction industry. The systems were used for the construction of the tunnel wall that houses the glass flight chamber, shear walls and basement retaining walls by Poullaides Construction Company, the contractor on the project. It is the first-of-its-kind project in Bahrain, featuring one of the tallest indoor skydiving tunnels in the world, where the wind speed reaches up to 290 km per hour. The height of the glass flight chamber is 12 m and its width is 4.3 m.
Paschal Concrete Forms, which next year marks two decades of active service in the GCC, also holds credit for other striking landmarks including two buildings which are close to completion at Bahrain Bay, namely the Cooperation Investment House building, which will house the Wyndham Grand Bahrain hotel within its twisting tower; and the ABG Tower, which is scheduled to open shortly. Paschal’s modular formwork were used for the columns and core walls of the Wyndham Grand Bahrain by the contractor Ahmed Qaed Contractors; and for the basement retaining wall and columns by Arabtec for the ABG Tower. These modular formwork systems were also used by KMC Contracting for the construction of the columns, core wall and basement retaining walls of Wadi Al Sail Mall in Riffa; and by Hassan Al Ansari –along with Paschal’s Deck formwork – for the construction of the columns, core wall and slabs for the Q House 3, an 18-storey residential apartment building in Juffair. Paschal’s Deck formwork was used for the construction of the slabs for Dragon City’s staff accommodation at Diyar Al Muharraq by Taitoon Contracting. Paschal modular panel systems provide a number of benefits, particularly in the construction of vertical elements on any type of concrete structure including water tanks, columns, shear walls and core walls, according to Amir Delghandi, general director of Paschal Concrete Forms, the Bahrain-based regional office of Paschal Werk G Maier, a premier German formwork specialist. “Due to the flexibility, durability and versatility of modular formwork panels, contractors are able to use modular formwork for footing, ground beams, columns, lift shafts, walls and staircases. This gives them the ability to reduce their costs by up to 30 per cent,” he points out. Meanwhile, more than a dozen ongoing projects, right from water tanks to oncology centres and from airport enabling works to shopping malls, are currently benefiting from the versatility offered by Paschal formwork systems, says Delghandi. Among such projects, contractor GP Zachariades is currently building the columns and walls for the King Hamad University Hospital’s Oncology Centre in Busaiteen using Paschal’s modular systems. The contractor is also using the German formwork systems for the second enabling works package of the Bahrain International Airport (BIA) Modernisation Programme and for the One & Only resort hotel in Seef. The Galleria shopping mall, which is close to completion near Al Ahli Club in Zinj, features columns and beams shaped using modular formwork by the contractor Dadabhai Construction, which is also using the system for the construction of the columns and core wall of the Juffair Heights residential tower. Another contractor, Ahmed Mansoor Al Aali, is creating a circular foundation for a water transmission development project using the modular formwork, while the system is being used by Abdul Jaleel Real Estate for the columns of Afaq Tower in Juffair, and by Ahmed Qaed Contractors for the columns and core walls of Essence at Dilmunia. Other projects are utilising the benefits of Paschal Deck system. 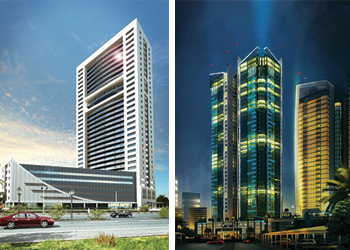 These include Devji jewellery factory in Hidd and a five-storey building and villa at Amwaj Islands, both being built by Delta Construction; and the MBM Tower and F Al Mutaw building, both being in Seef by Fundament SPC. The modular formwork in combination with Paschal Deck systems is being used for the construction of columns, core walls and slabs by various contractors including Kooheji Contractors for the Fontana Suites in Juffair, Ariva at Amwaj Islands and Fontana Gardens; and by Kazerooni Contracting for the Kazerooni Heights. Set up in 1997 as the main office for the Middle East, Paschal Concrete Forms has since become one of the leading suppliers of modern formwork solutions to the construction industry in the GCC. Paschal has branch offices in the UAE in Abu Dhabi and Dubai, sales agents in Iraq and a Scientific and Technical Office in Dammam, Saudi Arabia. The Bahrain operation moved into its purpose-built premises in June 2010 at the Bahrain International Investment Park (BIIP) in Hidd, where it has a production facility for modular formwork and a stockyard. Its parent firm Paschal Werk G Maier is a sought-after partner for concrete projects worldwide, with customers in more than 40 countries and 50 years of experience.